In Part 1 we discussed Systems in general, and how they need to be audited to ensure they reflect organisations’ policies and principles as well as being ‘approved’ and ‘fit for purpose’. We saw that our life is full of systems and in the main they work for us. Unfortunately, when they do not work for us, we experience dysfunctionality. We see this with Facebook (and other social media) essentially developed as a system to connect and create new relationships yet now being used to fuel hate and division in society. We also mentioned that organisations often favour the Systems Quadrant when observing and diagnosing solutions to problems at all levels of complexity. By doing this they are ignoring the other three quadrants and the interdependence of all four quadrants. For example, at a recent culture seminar of some forty Chief Executives there was a common refrain:’…we don’t want to talk about culture, we want to know how to manage the digital revolution!’. This commentary demonstrates how by attributing this complex issue to a System Quadrant solution these CEO’s may not be seeing how the digital revolution affects their organisation’s performance through the initial impact on the thoughts, beliefs and behaviour of employees which ultimately affects culture. The opposite is also true; culture has a profound effect on an organisation’s willingness to embrace and align with new technology. 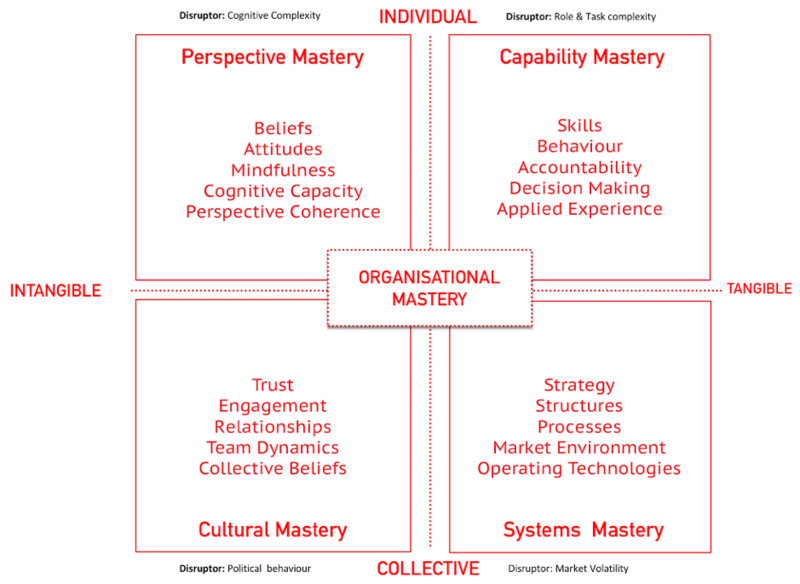 However, the focus of this blog turns to organisations and how collaborative systems leadership can be a strong driver to assist the creation of a resilient, vibrant culture that delivers outcomes at every level taking into account all four quadrants. Brian Walker and David Salt in their book ‘Resilience Thinking’* say resilience is “the capacity of a system (human or otherwise) to absorb disturbance and still retain its basic function and structure” – collaborative systems leadership is the pathway to resilience. Collaboration, resilience and vertical development have become part of the OD jargon in recent times, yet we all struggle to agree on what each truly means and so how to effectively operationalise them for both individual and organisation benefit. We at Cornerstone use the Integral Framework as a sense making construct that shows clearly the interdependencies in the organisational system and no one ‘thing’ is a silver bullet, no one object is the cause and no one person is to blame. We see where the models, issues and pain points fit into a moving picture and so respond more effectively to real time dynamics. Organisations have operated for a century based on the work of Frederick Winslow Taylor, a man with a brilliant mind for making processes efficient. His thinking revolutionised production processes making it possible to mass produce at lower cost – the focus being efficiency. Unfortunately, in doing so he deliberately eliminated frontline people’s ability to think for themselves by creating ‘standard operating procedures’ for them to follow. He also believed the only ‘beneficial’ thinking could be done by senior people who controlled the processes and created new ones. This brought about a rigid hierarchy based on ‘command and control’. The legacy of Taylor lives on in organisations today with its fascination for procedures, processes, siloed hierarchies and systems. Often described as ‘Taylorism’ or reductionism, we should remember that it delivered important outcomes in the late 19thand much of the 20thcentury but placed humans as subservient to the processes, structures and work systems they ‘served’. Taylorism is often observed when systems are implemented through finely crafted procedures prescribing how work should be performed, leaving little discretion for those that need to perform it. There may be contexts when this is important however in many, if not most instances, this leads to excess bureaucracy causing alienation of those needing to perform the work, greater error and higher inefficiency. However, when the focus is aligned with a shared understanding of Purpose, supported by capable and skilled people (with the ‘permission’ and ability to think for themselves), individual and team outcomes are significantly enhanced. Unlike the language applied to many organisation disciplines (think Engineering, Finance, Geology, Logistics, Safety etc), Leadership is a practice where a lack of shared common language causes unnecessary miscommunication, tension and confusion. Think of it this way, language should enable us to communicate practices, techniques and concepts with specificity and a common understanding. When we have this, we get a faster and more effective exchange of ideas leading to clarity and speed when diagnosing issues as well as potential solutions. A classic example is the simple word “work”. It is applied in many ways with different meanings. For example: “The work I was given today at work was very difficult work”. Three meanings of the word work appear in the sentence: the first denotes tasks undertaken, the second the place of employment and the third the effort applied. Definitions relating to words like task, leader, review, responsibility, accountability, level, authority all can vary and increase the level of confusion and error. Had a common understanding of the language relating leadership practice. Knew and operated within the legitimate boundaries of roles feeling the freedom to contribute to a shared purpose rather than the execution of procedures. Experienced a shared collaborative tasking system that gave clarity on expected outcomes and sharply improved productivity individually and collectively. Had clarity around individual, team, department and cross functional role accountabilities. Received and allocated work aligned to our level of skill and capability (allowing us to work in our ‘Goldilocks Zone’ (where the challenge meets skill and is “just right”) whilst enabling stretch to higher levels of capability. Could confidently and authentically contribute thoughts and ideas on difficult issues resolving them in real time in collaboration with others. Could be clear about who could and could not assign work, and to whom you can assign work. Collaborative Systems Leadership operates on this principle of Shared Purpose, encouraging leaders and team members to work collaboratively responding to workplace critical issues and opportunities quickly and effectively. Informed by solid research Collaborative Systems Leadership supports the outcomes described in the ‘Imagine…’ statements above through a design and delivery ethos relating to a deep understanding of complexity, collaboration and the importance of aligning shared and individual notions of purpose. How does a Collaborative Systems Leadership approach do this? By providing a common language and approach for determining work, tasks, roles to be defined, agreed and allocated to optimise success and align with purpose. By providing practiced insight into the relationship between successful complex problem resolution and stakeholder collaboration. By enabling us to measure and celebrate outcomes valued by our stakeholders meaning the success we celebrate is valued by those we are supporting. Collaborative Systems Leadership is an example of a system that is woven into all the Integral Framework Quadrants. It does this by its positive impact on beliefs and attitudes relating to the value we place on our relationships with colleagues and stakeholders, building skills in tasking and defining work outcomes for self and others, enabling the development of performance systems and coaching that support more complex work, and supporting the development of cultures eager to collaborate to produce real outcomes. If you are in an organisation looking to authentically increase outcomes for your critical stakeholders, we recommend you look closely at this Bloody System….